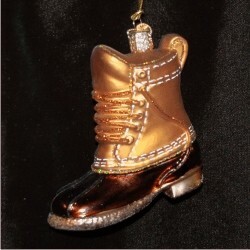 Whether you're a fan of LL Bean or have a favorite pair of these classic field boots, this unique ornament is a wonderful memento of special times. Personalize with the year at your option. The blown glass ornament measures 3.5"H, and arrives nestled within our exclusive velvet bag.